I usually don't have time to do any leisure reading (I only tend to read books that are related to my studies...bit boring..I know...) I think it's because I like "multitasking." Like knitting/crocheting while watching TV. I have not mastered the art of reading and doing handcrafts at the same time..I probably never will :P Is it even possible?! I might start reading a book with superduper enthusiasm but then the unavoidable happens and I start to think all the other things I could be doing. In most cases the book ends up buried under multiple balls of yarn (and when I receive a notice from the library the epic quest in finding the looong overdue book begins.) Maybe I have just been reading the wrong kind of books! 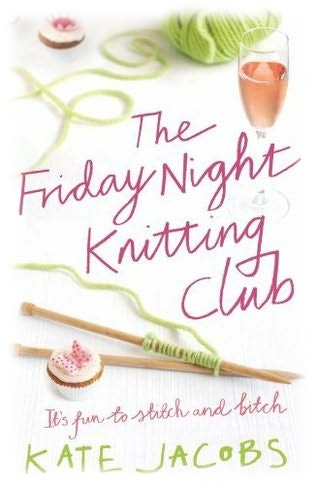 This is the conclusion I came up with the other day when I noticed that I had stumbled upon a book that makes me want to read it here and now and also makes me want to crochet and knit like never before! All thanks goes to my mum ♥Love her to bits♥ who brought me this book and said "I think you might like this one." She was sooo right! 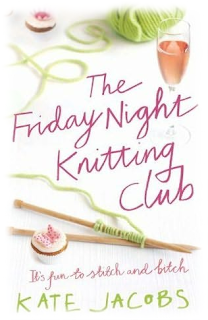 The book is called "The Friday Night Knitting Club" by Kate Jacobs.